Hello, just downloaded this app and would love to use it as my main media player. iTunes is just too heavy and this seems really lightweight in comparison. 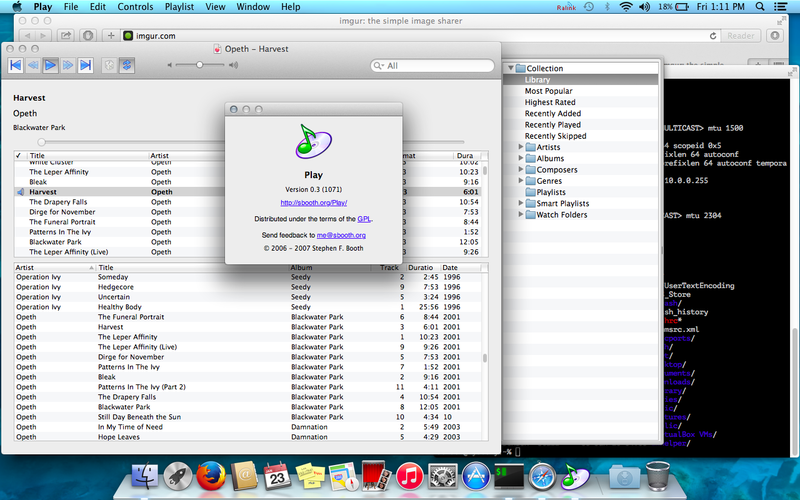 I've loaded my entire music library into the program though nothing seems to play. I've tried at least 100 different songs, most were mp3s but tried a few .wav files as well. Volume is up (durrr), edited a few things in the preferences hoping for something, though nothing will play at all. Is there any output in Console indicating what went wrong? I can't think of a reason why Play wouldn't work on Mavericks but I haven't tested it. 2015-01-25 12:47:00.147 Play[1658:303] -[NSConcreteAttributedString initWithString:] called with nil string argument. This has undefined behavior and will raise an exception in post-Leopard linked apps. This warning is displayed only once. 12:47:00.147 is where I clicked on a song to try playing it, the other warning just before that happens right when I open the application. Came across this thread via Google (specifically searched for that "nan" error), tried unchecking the "Rescan" option but still nothing. Edit: Also came across this post which might help. http://forums.sbooth.org/viewtopic.php?f=12&t=4819. Someone mentioned they "fixed" it by bypassing something or other. I have no idea what they did, though I can see what they're referring to in the file mentioned.